As the roar of the breaker came up behind my shoulder I looked back to see green water curling towards our stern. *Boom! * The wave smacked the side of the hull. In the next instant the wave top crashed into the cockpit, sending gallons of cold water over me and immersing my feet ankle deep. My jacket, pants and sneakers were drenched, and the water slowly drained. No time to worry about that though, as I steered to ride the wave down. This wasn’t the first breaker we’d had that day but it was the one that caught us the worst. 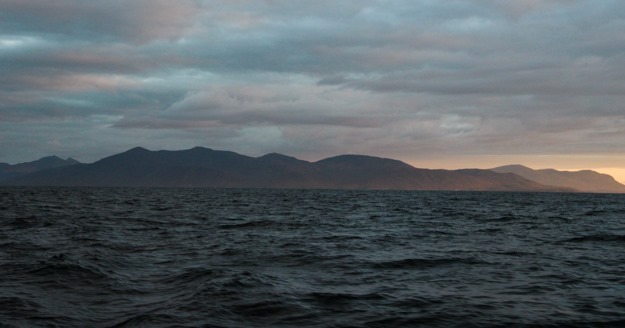 It was June 15 and we were crossing Hecate Strait from the south of Haida Gwaii to the Central Coast of BC. With a forecast of NW 20-30 we thought we’d have a tough but manageable day, but ended up having a steady 30-35 knots and 6 to 14 foot waves at a 6-7 second interval (very short interval, with confused tidal interactions in some places). Apologies that I don’t have many pictures, but conditions were way too difficult to spend time doing photography. All photos except for one were taken before 10am, in the relatively easier conditions. Sailing into the sunrise, 6am. The best sailing of the day was done by 9am! Wave state range: 3 ft (near Haida Gwaii), 6 ft, 9 – 12 ft, confused tidal interactions, confused swell + wind wave interactions. Waves as measured by South Hecate buoy: 2.3m (7.5 ft) significant wave height at 5:30pm, 6 second period. Maximum zero crossing wave height 4.3m (14 ft). Sail configurations: full sails (main + 135% genoa), reefed main + full genoa, double reefed main + full genoa, double reefed main + double reefed genoa, double reefed main + staysail, staysail alone, double reefed genoa alone, full genoa. 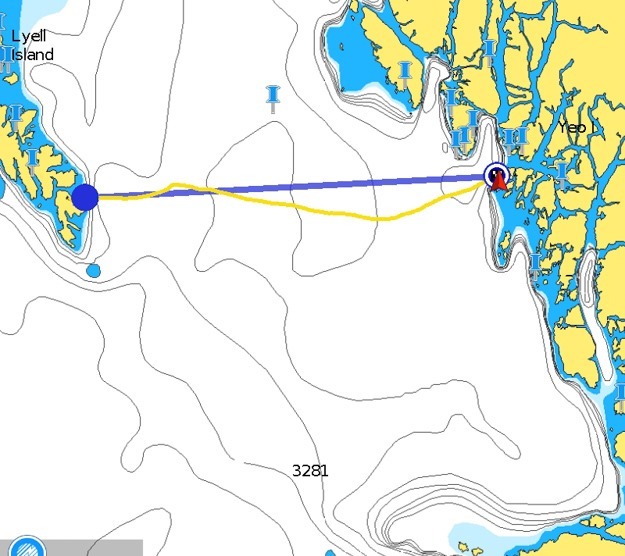 Route across Hecate Strait (purple line is the rhumbline – straightest course – and yellow is our actual course). We initially stayed close to the rhumbline or headed up above it (because we knew building winds would force us more downwind). The part where we were forced off the rhumbline was mostly 30-35 kts with staysail alone, and the turn where we pointed more northeasterly is where we decided to try to make Milbanke Sound. To cross Hecate from the south of Haida Gwaii, the one thing we knew we needed was a forecast of northwest wind. Given the wind had been south for 2 weeks straight, northwest wind in June was starting to look pretty rare. When we got a forecast of a high pressure ridge bringing northwest wind just as we were ready to depart, we were elated. View of Haida Gwaii behind us at 6:11am. The night before we checked the forecast one last time. They were still calling for NW 20-30. 30 is on the high end of what we’d want, but the forecast today had been for NW 10-20 and it never got past 6 knots. So we were hoping the Canadian forecast was a bit overly conservative again and would be close to 20 and maybe 30 only briefly. (What we ended up getting was 30-35, and almost nothing below 30). 30 knots is about twice the force of 20 knots, so a forecast of 20-30 is actually a huge range. 20 would be fine, 30 not so much. 30 is borderline gale (Canada labels as gale anything above 34). But the next 3 days after that were forecasting 30-35, definite gale conditions. So we knew if we didn’t escape now we might be stuck in Rose Harbor waiting for 4-5 days. Plus the swells in Hecate would have built over those 4-5 days and take several days to calm down. Our day got off to an inauspicious start when we tried to pick up anchor at 4am. The anchorage had lots of kelp and a mass of kelp plants had weighed down and encapsulated our anchor. Then as we tried to motor forward we got stuck in a kelp clog. Our engine shut down, twice. Fortunately we were able to drift out of it, throttle up, shred some kelp and were out of there. We motored about an hour to get out to the Strait where there would be wind. As the sun rose, we got enough wind to sail and had a couple hours of beautiful downwind sailing – little did we know that would be the only fun sailing we had for the day. As we expected, the wind built quickly, so reef, reef, reef was the order of the day. Oftentimes we reef too late, so today we had drummed into our heads repetitions of what we knew we needed to do: reef early, reef often, reef reef reef. Energy conservation (our energy) is critical on a long passage, so we knew we needed to avoid being overpowered so we could use the autopilot as much as possible. About 9am the double-reefed genoa was getting difficult to handle, so we pre-emptively switched to the staysail, knowing that it’d be much harder to rig if we waited too long. 18 knots true wind speed at 9:40am. Our wind meter under-estimates on deep wind angles, due to the mast blocking it a bit, so the wind was closer to 20-25. We had a double reefed main + staysail at this time. Hoisting our staysail involves some work on the bow, and the waves were quite big by now. Moving around a boat in steep waves is like riding a bucking bronco. We were rolling 20 degrees every 6 seconds. I was harnessed in to our jacklines of course, but I knew if I fell overboard I quite possibly would be dragged and drowned. Or I could release the tether and maybe be lost forever because it’d be quite hard for Natalie to turn the boat upwind in that sea state and wind. So this was the start of our anxious moments. As noon approached the wind started gusting over 30 and our double reefed main was becoming a problem now. We were surfing at 7.5 knots and couldn’t dump any more power from the main, already having it plastered against the spreaders. Our third reef might have been useful here but I didn’t have a reef line rigged for it – thinking we’d never need it. So we dropped the main and flew under staysail alone. Amazingly, this tiny scrap of a sail kept us moving at 5 to 6 knots. Getting the main down was another harrowing moment though because we had to turn up into the wind and waves. I took a wave over my back and Natalie was in a state of shock from the waves we were in. We sailed on the staysail alone the majority of the passage, for about 10 hours. We went back and forth between using the autopilot and not. It wasn’t able to handle the bigger swells, but hand steering through them for hours on end led to me getting completely exhausted. I was steering in a zombie like state at times, physically and mentally depleted. Eventually I sailed on adrenaline alone, realizing the only way we’d get out of this was to keep on going. A couple dousings of cold salt water helped. Waves at 9:40am. Challenging, but some of the smallest waves we saw this day. After 2pm they were at least twice as bad. The waves got worse, building to house sized waves or at least small shack or big 4×4 truck sized. In the troughs we could no longer see the horizon or land. I prayed there were no other boats out or logs in our way. Some of the waves were much larger than others, and those would curl into breakers, green water rushing towards our boat. The word rogue wave came to mind many times – although the average wave height might have been 7 feet, there were many in the 9-12 foot range. We took wave spray over the bimini and solar panels several times. We were grateful for our full enclosure for the thousandth time because it blocked a lot of the wave spray. I later found salt on the mast 13 feet above waterline. 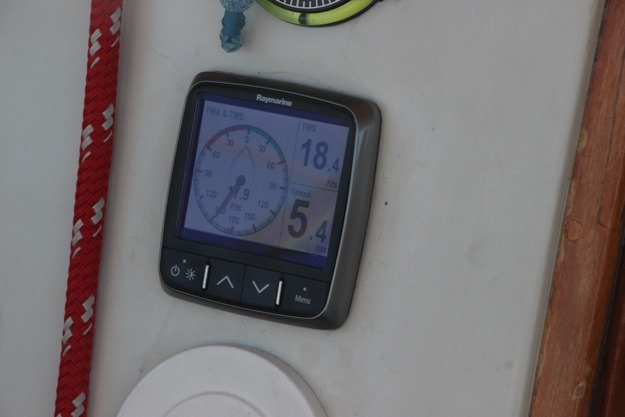 Our autopilot is a Raymarine wheel pilot. It’s underpowered for our boat, and pretty much useful only for motoring or easy sailing. In big swell it struggles. We had it trip the circuit breaker twice, get overpowered 2 to 3 times, and it resulted in us taking waves over the boat more often than when I was helming. A better autopilot would’ve been a very welcome addition before this year’s cruise. I’m still not sure however what kind would be better or whether it could’ve handled sailing through breaking waves. Our first crossing of Hecate was exhausting, but this was an order of magnitude worse because we were sailing in a gale. With 9 sail changes (some easy, some hard) and 10-12 hours of hand steering in the most strenuous wave conditions you could imagine, I was exhausted. It took the utmost concentration. Steer fast to starboard as a big breaking wave picked us up, and then fast to port as it careened us down. Natalie is excellent at helming but these were beyond conditions she could handle. She felt bad because she couldn’t help more, but was super supportive in keeping my spirits up and fetching snacks or clothing to keep me sustained and comfortable. Around noon we both listened to music / podcasts on our headphones for a couple hours. This helped tremendously because it allowed us escape from the raging sounds of the wind for a bit. Being in 30-35 kts with close spaced waves is a cacophony of unpleasant noise. The wind howling, halyards slapping, waves slapping the hull, and all the unidentified mystery sounds – like the strange *thump* that came from under the steering quadrant occasionally (I think this was either our rudder getting pushed up by wave action, or something getting knocked around in the storage area below the cockpit). With music or a podcast playing over noise blocking earbuds, the sail became almost pleasant, for a bit. But between 4-7pm it got to the point where I no longer had the energy even to listen to music. And I needed to listen to the sounds to know when a breaker was gaining on us or listen for a rig component breaking (thanks to our rerig I didn’t have to worry about this that much). I could barely talk, doing so would take too much energy. From 7pm-10pm I got a bit of energy back, probably adrenaline from realizing the only way we’d survive this was to keep going. We were filled with stress. I wished I was someplace else, anywhere else. I was aware that one mistake could imperil us. 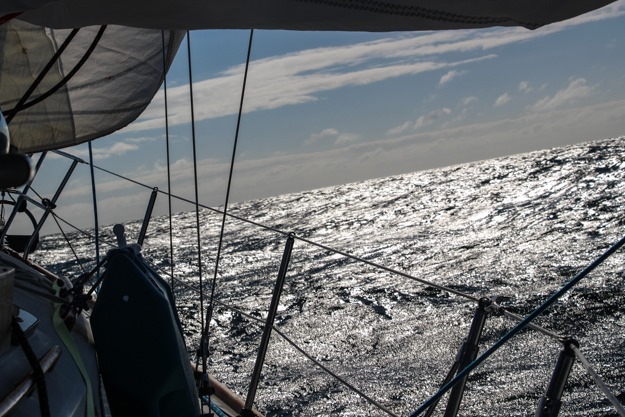 Steering in these waves in the dark would be very difficult, and I didn’t want to end up on a lee shore – if we didn’t have a safe, approachable harbor, we might not be able to power upwind against the wave and wind state. Our staysail is probably our most useful boat gear that we hardly ever use. This is the first time we’ve really used it for its designed purpose – running downwind in a gale. A former owner of our boat bought it and equipped the inner forestay for it probably at least 20 years ago. 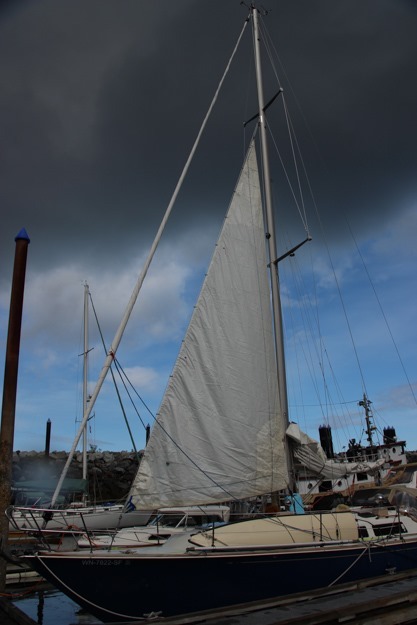 Our staysail test rigged at Sandspit marina. Conveniently dark clouds in the background. 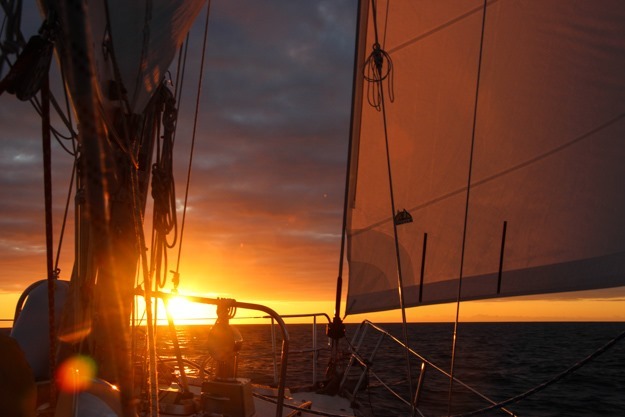 We rode on our staysail alone for the majority of the passage, for close to 10 hours. We probably could have used a slightly larger foresail to get speeds higher than 5.5-6.5 kts, but our 135% genoa doesn’t reef well beyond 95%, and it was more important to keep the boat manageable. Slightly below hull speed decreased our chances of broaching in a gust or breaker. 9:41am, 5 hours into passage, under double reefed main and staysail. As we neared within 4 hours of shore, we had to plan which anchorage would be safest to reach. Milbanke Sound was our preference, for being the nearest (and the only one we could make before dark) but Queens Sound below Goose Island was our backup. The trouble with making Milbanke Sound is it wasn’t on a broad reach rhumbline, meaning we’d have to head up to a beam reach in the gale. Any angle above 150 apparent wind was difficult to hold because it put the swells on our beam. We decided to try going for Milbanke, and are glad we did. The wind backed a bit westerly, as I had hoped, due to the shape of Milbanke Sound. Beam reaching put us in a precarious position with the breaking waves though. 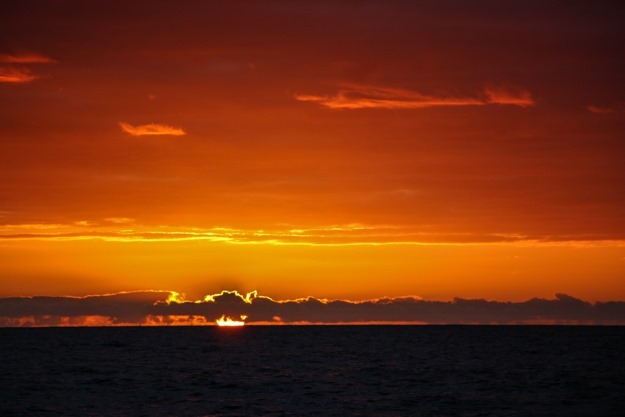 Beam on to a breaking wave is a recipe for disaster – the boat will broach up and take green water over deck. So we steered almost constantly looking back over our shoulder. If we saw a wave that was going to break we steered down to 120-150 apparent, rode the wave and then went back to 90. NW wind waves were meeting a slight SW swell, plus there were confused waves due to current. We saw waves “high fiving”, or “wave claps”, where two waves would meet and spray shot vertically up into the air. 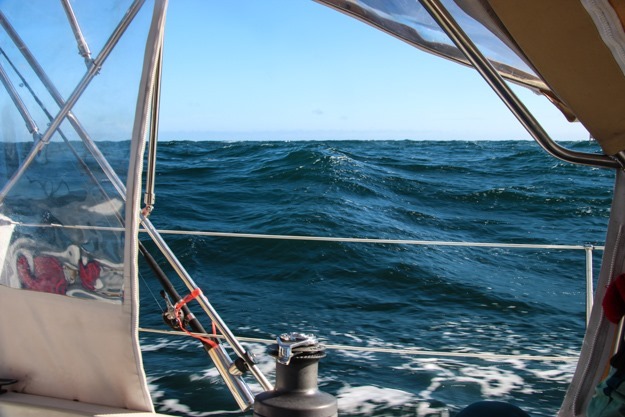 As we made our approach, we heard Prince Rupert Coast Guard announce over VHF 16 about 9pm there had been a weather forecast change – apparently Hecate had been upgraded to a gale warning. We already knew that, given we were in it – now that’s what I call now-casting! Another reason I was glad we made Milbanke Sound in twilight (about 10pm – darkness is 11pm) is we dodged 10 to 20 logs – some entire trees – on the way in. In the dark we would’ve hit at least a few of those. The hull can take a log hit but if it hits the prop that could cause damage. St John Harbor is guarded by a reef line called Rage Reef – named as such because of the swells that break along it in a raging northwesterly (like we had). We navigated well though, and as we entered and turned on our engine, the cooling water wasn’t flowing. Thinking we had some kelp clogging it from our kelpy anchorage that morning, we turned off the engine and sailed into the anchorage about 2 miles with the furling genoa. We used the engine briefly to anchor. Arriving in St John Harbor near dark. Later I cleaned out the raw water filter and found some jellyfish guts (we’ve had hundreds of jellyfish in some of our anchorages recently, surrounding the boat, and it’s unavoidable that your prop chews up one or two of them). This wasn’t the problem though – it appears our raw water filter can develop an air lock sometimes (water drained out the thruhull and air got introduced on our rough passage I guess). Bleeding the air by loosening the raw water filter cap fixed the issue. We’re looking forward to getting back to our roots – cruising between scenic anchorages in areas that have options – options for cruising in more protected channels when a gale is running. In Haida Gwaii we didn’t have many options because it’s exposed to Hecate Strait and there was a gale nearly every day (for half of June). If anything this passage taught us the best way to cross Hecate Strait is by motoring. And that’s coming from someone who hates motoring. It’s theoretically possible to get a forecast of 10-20 knots lasting 18-24 hours for a fun 100% sailing crossing; but after watching the weather in Hecate for a month that seems extremely rare. More often, the wind in Hecate is either light and fluky, or gale force. This June might not have been typical though – every year (or month) could be different. This entry was posted in cruises, hard times, trips on June 28, 2018 by Patrick. Been out of service but I meant to comment – after crossing Hecate Strait in a gale, you can seriously pretty much go anywhere. That’s one of the nastiest places around to get caught in weather what with the shallowing up!